Water is a precious natural resource that supports all human, plant and animal life. We use it to grow food and make goods. It supports our way of life. Australia is the driest inhabited continent, and our frequent droughts and long periods of hot dry weather make water an even more valuable resource. We store more water per person than any other country, to make sure we have enough during times of drought. When the dams are full, we store over 500,000 litres (half a megalitre) of fresh water for every person. However, our growing population and variable climate means that saving water makes good sense. Using water wisely, more recycling projects and desalination, along with our water supply dams, means greater Sydney's water supply is in a strong position. Thanks to the water wise efforts of homes and businesses in the greater Sydney region, we are using the same amount of water now as in the 1970s - despite an extra 1.4 million people. Water Wise Rules were introduced in 2009 throughout Sydney, the Illawarra and the Blue Mountains. All hoses must have a trigger nozzle. Watering is allowed before 10am and after 4pm on any day - to avoid the heat of the day and reduce evaporation. No hosing of hard surfaces such as paths and driveways, but washing vehicles is allowed. Fire hoses may be used only for fire fighting. In Sydney, around 1500 megalitres of water is supplied to 1.7 million homes and businesses each day. Households use most of this, around 70%. The rest is used by businesses and government. To better understand how much water you use around the home, try this simple experiment. Hold an empty 1-litre milk carton under a running tap. Time how long it takes to fill. Compare this with the time the tap is running when you wash your hands, brush your teeth or have a shower. Calculate how many litres of water used if you run the tap while doing these activities. Keep this in mind next time you turn on the tap. 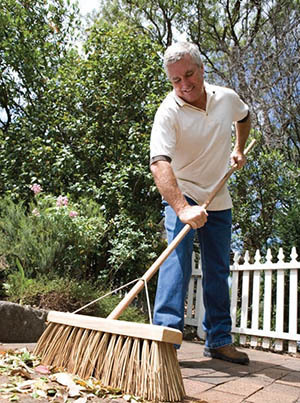 Paths and driveways - use a broom to clean up leaves, grass clippings, dirt, dust or litter. Swimming pool - use a cover. Taps - make sure they aren't left dripping, and never turn the tap on too far. 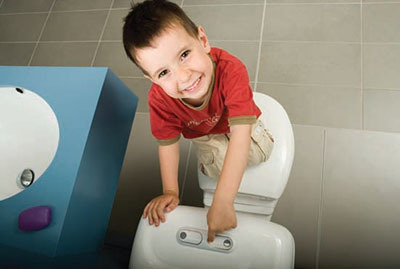 Toilets - use the half-flush. 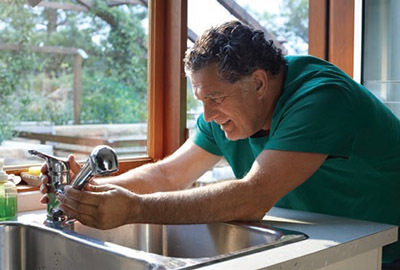 Taps - turn off the tap when brushing teeth, and install a water efficient tap or aerator. Sink - use the plug to rinse when shaving. Showers - install a water efficient shower head, and have quicker showers. Sink - use a plug when washing food or dishes. 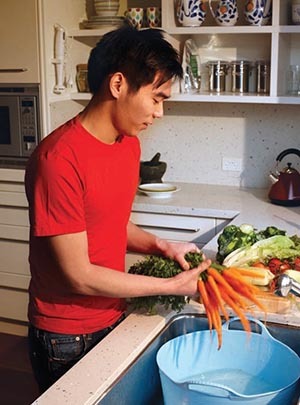 Taps - install a water efficient tap or aerator. Dishwashers and washing machines - wait for a full load, and when it's time to replace, choose a more water efficient model.